There is a video on Stone’s blog of Greg and Steve explaining the idea, check it out. 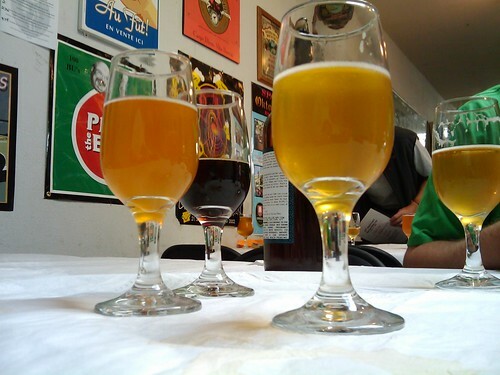 This Saturday three beer events are taking place, one in north bay, one in east bay, and one in the city. I’ll be going to the one in the city. Not exactly a beer dinner, more like a buffet. Beers will be from Valley Brewing, including IPAs, sours, barrel aged stuff, etc. Food from 4505 meats. Imagine this, but with a shitload more meat and beer. Music, food and beer specials…..
After a raucous night of tasting imperial stouts I managed to get out early in the morning (around 11am) and shlep over to Toronado for their 22nd anniversary. By the time I arrived there was quite a bit of a line, but luckily found Alex and Party Dan close to the entrance and joined them in line (thanks fellas!). Once in we had to wait some 30 minutes before getting the first beer as the crowd of beer geeks stampeded into the bar. 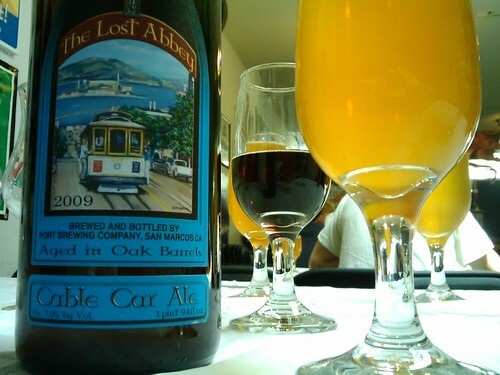 Like many, I was looking forward to Lost Abbey’s Cable Car blonde sour and that’s what I drank most of the day. The was many other special and rare releases, most of which I don’t remember, oh well. The Nelson IPA really stood out, it was amazing and holds up to Pliny any day. We sat in the rarely visited back area of Toronado, right next to the food. Steve brought in a bunch of Hawaiian BBQ which was awesome. Overall, a great day and can’t wait till next year. Yeah I ‘ve been lagging in updating the blog, but here is a quick update about the August tasting. Although the theme was Imperial Stouts, we had to switch it up a bit to not overload the palate with all that sweet gooey thickness. We started with a run of the mill pasteurized lager fresh of the plane from Belarus, followed by a mystery homebrew from the back of my fridge. An excellent Berliner Weisse from Dogfish Head, Festina Peach, finished up the introduction. Next we went into the stouts starting with Rogue’s Chocolate Stout and then getting really into it with Deschutes Black Butte XXI and Alesmith Speedway Stout. 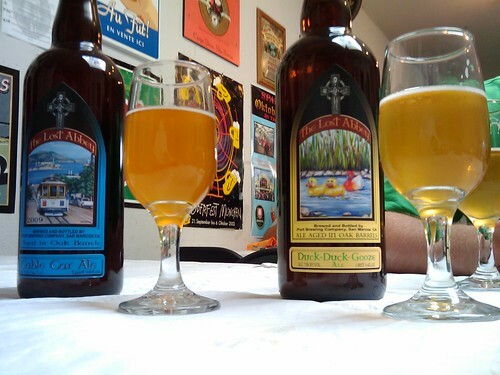 Check out the tasting chart for ratings and the rest of the beers tasted through the night. Any theme suggestions for the next tasting? A perfect way to capture a season. By using a sour beer and some vinegar, cherries can be preserved and enhanced at the same time, to be served at a later day or for a special dinner. Try these cherries with a cheese plate, serve with a grilled piece of veal or pork, a torchon of foie gras, or even as the cherry for your Manhattan cocktail. The beer and spices blend with the cherries sweet and sour flavor, creating harmony on the palate. Sounds awesome, eh? Get the recipe over at Bottoms Up. Boulder, CO • August 17, 2009 – The Brewers Association, the trade association representing the majority of U.S. brewing companies, reports America’s small and independent craft brewers¹ are still growing (see Craft Brewing Statistics) despite many challenges and are continuing to provide jobs to the U.S. economy. Dollar growth from craft brewers during the first half of 2009 increased 9%, down from 11% growth during the same period in 2008. Volume of craft brewed beer sold grew 5% for the first six months in 2009, compared to 6.5% growth in the first half of 2008. Barrels sold by craft brewers for the first half of the year is an estimated 4.2 million, compared to 4 million barrels sold in the first half of 2008. The number of US Breweries is the highest it has been in 100 years. Download a high resolution version of this image. Only three days before I get to San Diego for Stone’s 13th anniversary fest, they are hosting a beer and breakfast pairing. This isn’t some scrambled eggs and a bud, its a six course meal! No wonder they are hosting it at dinner time. Just take a look at the menu, if it doesn’t make you salivate, you are not human. Find out about other Stone Brewery events on their events calendar. P.S. they are also doing a beer and chocolate pairing that looks amazing, check out the menu.